Recently, there were numerous conversations that took place on Facebook asking “Is Glatt Kosher necessary on El Al?” The question is an interesting one considering that ALL the food on El Al is supposedly kosher. I recently flew El Al (in December) and I automatically ordered a kosher meal (without thinking – that’s my knee jerk reaction when speaking to airline customer service before all international flights), but was notified by their customer service that all of their meals are kosher. We offer a choice of meals, created in the Tamam kitchens at Ben-Gurion Airport and at several other kosher kitchens around the world. Glatt Kosher meals are labeled on the El Al website as “Strictly Kosher” meals, should you want to order those. …By mandate, all of El Al’s commissaries are under kosher supervision. The Rav Hamachshir of El Al sets the standard for the entire El Al network. In Israel, the commissary is under the kashrus supervision of the Rav Hamachshir of Ben Gurion airport. In Canada, the commissary is certified by the COR of Toronto; in England the London Beis Din; and in France the Paris Beis Din. In Thailand the commissary is certified by Rabbi Kantor, and in the U.S. by the OU. Since all of the commissaries are approved by the El Al certifying rabbi, El Al’s chinaware circulates between all ports of call. El Al carries four sets of chinaware which include two sets of meat dishes and cutlery for First Class and Business Class, and two sets of dairy dishes. Coach uses disposable dishes. Unlike non-kosher airlines, El Al kosher meals are plated and packed directly in a hot box, contain a double security seal and are shipped to the airport. Bread and wine which are served with the meals are shipped separately. First Class and Business Class meals from Borenstein prepared for other carriers are plated onto new chinaware that the airlines send to the commissary, doubled wrapped and sealed. Coach meals are prepared on disposable dinnerware with a double wrap and seal. These meals are sent to LSG-Skychefs, which ships the kosher meals to the sub-kitchens for distribution to various airlines. All meals are prepared in the same area with the exception of Regal meal service, which is prepared in its own kitchens in the Borenstein facility. All Regal meals are individually double wrapped and sealed at the commissary. Bakery items that are used for both Regal and Borenstein are baked in the Borenstein bakery on the premises. This article seems to imply that all meals on El Al are “kosher” but not necessarily Glatt or Mehadrin. 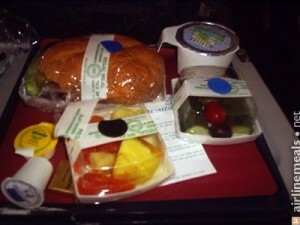 The Glatt meals are supplied by a different caterer and are standard double-wrapped kosher airline meals. The regular food is kosher when it gets to El Al, but there is no supervision of the use of ovens or handling of food once the food is in the possession of El Al. So a flight attendant could use the ovens to heat up his own personal (and possibly unkosher) food, and then pop your El Al meal in there afterwards. That seems to be the main issue here, the use of the ovens by El Al employees, which can be used for anything and are not supervised by any kashrut authority. The implication here is that cold food from the regular meals should not be an issue whatsoever, but rolls, which may be heated up, could be an issue. Multiple Facebook comments stated that the OU certifies all of the meals on flights originating from the US. The only difference being that the non-Glatt meals aren’t double-wrapped, whereas the “Strictly Kosher” ones are. Regular meals on flights originating in Israel (as stated above) are all under Rabbanut supervision. The issue, again, is whether or not the ovens are being used by El Al employees with non-kosher food. This may take more investigation and conversations with El Al, but ultimately, we may never know. During Shmita years it could be another issue for meals on flights originating in Israel, where the fruit & veggies from the regular meals could be problematic. A: If your minhag is to only eat Glatt or Mehadrin meat, or if you’re concerned about the oven issue, your best bet it to order the “Strictly Kosher” meal and you should likely best avoid any items (like the rolls) that are not included in the double wrapping. If you are less makpid (stringent), the standard meals are still kosher and could serve your purposes as well. It all depends on your level of comfort and kashrut. (Although I do have to say that the regular meals did look more appetizing than my Glatt meal this past winter). If you’re still unsure, please consult your local Orthodox Rabbi. Note: If you order any special meal, be it vegetarian, Strictly Kosher, diabetic, Gluten intolerant, low salt, child, fruit only, fish only, chicken only, vegan, hindu, etc…. you will get your meal before everyone else. Plan accordingly. Note: Only one wine on the El Al First Class / Business Class menu is mevushal.